When it comes to attracting new business and growing the economy, you have to know your competition and ensure that everyone knows why you’re best. In suburban Cobb County, local leaders have been busy getting to know how this portion of the Metro Atlanta area stacks up against other cities near and far. 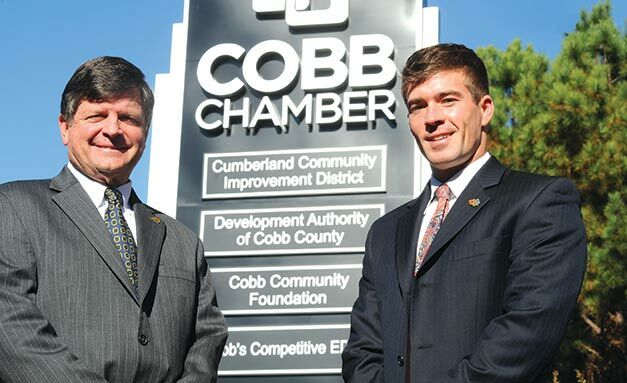 Just like any product, you have to take a close look at what is working and what needs improvement, according to Cobb Chamber of Commerce President and CEO David Connell. That was the idea behind Competitive EDGE – a five-year regional growth initiative aimed at highlighting the county’s natural strength and targeting the industry clusters that were already finding a home here. “We wanted to define the communities we compete with and the things we need to do to improve Cobb County that will address our redevelopment needs,” explains Connell. The program, which was formally launched at the beginning of 2013, has already borne fruit. As the county, the region and the state have begun to come up out of the Great Recession, the economic development wins have started to pile up. “We’re talking to a variety of companies and different industry types, from corporate and regional headquarters to industrial prospects, that are interested in existing buildings on the market or in some cases greenfield development,” says Michael Hughes, Cobb County’s economic development director. A big part of the EDGE program was just finding out what needed to be done to attract more companies to the county. One of the first changes was designating a single contact for economic development inquires. That led to the chamber’s Vice President of Economic Development Brooks Mathis being named point person for all corporate inquiries and a liaison between business and government. Of course, the county scored a major victory in November with the an-nouncement that Major League Base-ball’s Atlanta Braves would abandon their home at Turner Field and head to Cobb in 2017. Over the next three years, the team will construct a new ballpark on 60 acres at the northwest intersection of I-75 and I-285 in the Cumberland Mall area. The $672-million project will be built with considerable financial support from the county. And there’s more economic news. Last year’s relocation of Talenti Gelato, the nation’s best-selling gelato and third bestselling premium ice cream, to the county has proven to be more advantageous than expected. The company, which relocated its primary production headquarters to a building in the Marietta Industrial Park, has grown faster than anticipated, adding 100 jobs as it expanded production lines. Cobb is also the home of two other expanding companies – The Weather Company (formally known as The Weather Channel) and Infosys, an India-based multinational provider of business consulting, information technology, software engineering and outsourcing services. Along with new businesses, existing companies are also growing. Elf on the Shelf has continued its rapid expansion, selling a “magical” toy elf whose main job is making sure children behave. They are told that it flies back to the North Pole nightly to report to Santa on whether children have been behaving and then reappears the next morning in a new location – maybe in the freezer or hanging from a chandelier. Children can also send special messages to Santa via the elf. This year the character took on new duties as a birthday elf – creating new opportunities for sales. Cobb is considered the best-educated county in the country, with nearly 45 percent of its residents holding bachelor’s degrees. Not surprisingly, higher education is one of the prime economic engines driving the local economy; there are some 42,000 college students enrolled in one of the county’s post-secondary institutions. Two of Cobb’s best-known universities, Kennesaw State and Southern Polytechnic State, both part of the University System of Georgia, are set for a merger, as Southern Poly becomes part of KSU under the leadership of President Dan Papp. With a focus on technology and engineering, Southern Poly alone had a $222.7-million FY 2012 impact on the local economy. About a quarter of its students are Cobb residents, and the school is a major player when it comes to economic development. As the economy sank into recession beginning in 2007, Cobb lost nearly 36,000 jobs – fully eight percent of the workforce. Those losses effectively wiped out gains made since 1998, with many coming in construction and service industries. One legacy of the job losses was a widening gulf between the affluent and low-wage earners. High-paying sectors such as healthcare, professional, post-secondary education and businesses services have continued to grow, giving the county one of the highest median household incomes in the Metro Atlanta area. That’s one reason the county has made revitalization of two of its most economically depressed areas a top priority. If you look at a map of poverty in Cobb, the two places that jump out with the highest concentrations are in Mari-etta and South Cobb. In the south end, companies are expanding, apartment complexes are being upgraded and new business is starting to take root slowly, but surely. With its proximity to two interstate highways, the area is a good location for warehousing and logistics. The area has gotten two big symbols of that momentum in the form of two very different construction projects located practically next door to each other. With its thrill rides, concerts and attractions, the sprawling Six Flags theme park has long been a favorite for family outings and the county’s biggest tourism draw. Since opening in 1967, it has grown to generate more than $175 million in economic impact in 2012, and those numbers are expected to rise with the addition of a new water park. Hurricane Harbor will feature an 800,000-gallon wave pool, a multi-slide tower, a one-of a-kind single slide tower with two extreme slide thrills and an interactive children’s play area. The attraction is set to open Memorial Day weekend 2014. It will replace the Southern Star Amphitheatre. The park has scheduled concerts and events there since 1986, but they will move to a different area of the park. The new attraction won’t compete with the popular Six Flags White Water in Marietta, according to Park President Dale Kaetzel. The Six Flags parent company is spending more money to upgrade the Cobb venue than any other park in its portfolio, he adds. In next few years, the company plans to add other attractions as part of an unspecified multi-million dollar investment. In Cobb’s largest city, Marietta, leaders are hoping that a major infusion of public cash will be able to transform one of the city’s most depressed and crime-ridden sectors into an economic engine. Franklin Road is a long street of strip centers and nearly a dozen apartment complexes. The corridor is also ground zero for the city’s efforts to break the cycle of crime and poverty and changing demographics. In the 1980s and ‘90s, students from nearby Life University and Southern Poly joined young professionals in filling the apartments and condos. When enrollments dropped, complex managers had to scramble to find new tenants. The street became poorer and crime common. In November, voters approved a $68-million redevelopment bond issue. The bulk of these funds will be used to purchase and demolish an undetermined number of apartment complexes. The effort is expected to free up about 190 acres that could be sold or leased to private developers. The city tried community policing in the form of officers on bicycles, then used about $1 million in federal funds to set up a “weed and seed” program to root out crime. Now city officials say that by reducing the number of apartments, those that remain will be financially stronger and choosier about their residents. While the city plans to let the market determine the exact form of development, the prospect is for more opportunities for shopping, entertainment and employment along the street. One of Cobb’s core industries that has gotten a lot of attention lately is travel and tourism. In fact, accommodating visitors is the county’s biggest moneymaker at $2.18 billion – up five percent over the previous year’s $2.02 billion. It also employs – directly and indirectly – more than 31,000 people. In another indication that the industry is growing, hotel and motel tax receipts rose 8 percent in the county. “That means people are traveling again and doing all types of travel, from leisure to business,” says Holly Bass, CEO of Cobb Travel & Tourism. Conventions are also up at the Cobb Galleria Centre, which is having one of its best years since 2008. Occupancy has increased 10 percent year over year; the center hosts almost 1,000 trade shows, corporate meetings, weddings and other events annually. Visitors come to Cobb for more than just business. History buffs are finding plenty to see as the 150th anniversary of the Civil War continues. Many visit historic attractions such as the Southern Museum of Civil War and Locomotive History, which is home to The General, the locomotive stolen by Union spies in the infamous Great Locomotive Chase. Another big attraction is Kennesaw Mountain National Battlefield Park, which gets more visitors each year than Gettysburg. Family reunions and sports are a big, if often unrecognized, driver. To promote these sports, the CVB recently organized a Cobb Sports Alliance, made up of 45 leaders of sports organizations from around the county. The group has been tasked with finding ways to promote the county as a sports destination and highlighting the county’s assets for sports teams. One of those venues is the new $1.8-million Swift-Cantrell Skatepark in Kennesaw. With a street-league certified 40,000-square-foot plaza, it is one of the largest concrete skateparks in the Southeast and one of the first permanent parks to feature elements modeled on a street league design. “We look to host a lot of local and regional and some national events,” says Mayor Mark Mathews. The city is also benefiting from projects funded by nearby Kennesaw State University. Two new private residence halls have been built to accommodate the increasing number of students attending the state’s third largest university. These include West 22, which completely leased its 850 spaces and is preparing to build out some additional space for retail. American Campus Communities’ U Club on Fry recently opened and quickly filled its 450 spaces. A second phase is also underway to bring occupancy up to 800 beds. Their success has brought a stream of companies with plans to build similar student-oriented developments. So far the city has turned all of them away following revised enrollment estimates from KSU that are walking back earlier predictions of continuing growth. “A lot of it has to do with their being land constrained in terms of adding more academic buildings, but the big thing is they don’t have enough faculty to increase enrollment and they can’t add faculty because they don’t have the budget for it,” says Kennesaw’s economic development director Bob Fox. While there may be less demand for student housing, Kennesaw is moving forward on both multi-family and single family residential projects around the city. A site on Main Street and Watts Drive is slated for 250 apartment units with 15,000 square feet of retail space and a six-level parking deck. Another 140 residential units with commercial are planned on Dallas Street. In addition, 50 single-family homes are slated for development on Moon Station Road. Farther north in Acworth, the long-awaited Dogwood Forest assisted living and memory impairment development has finally gotten underway. The property once occupied by an auto dealership has been on the verge of breaking ground for several years now. Driven by developer Dan Needle, construction has begun on a $22-million, 100-unit facility – smaller than the original concept, but welcomed by the city.